AUTO QUOTES BASED ON 2-BEDROOM MAIN HOUSE RENTAL ONLY. A secluded retreat with over 300 feet of private lakefront nestled in the Olympic National Park, on the north shore of gorgeous, pristine Lake Quinault awaits you! Located on a private cove, there are no neighbors in immediate sight; this is privacy and seclusion at it's best. 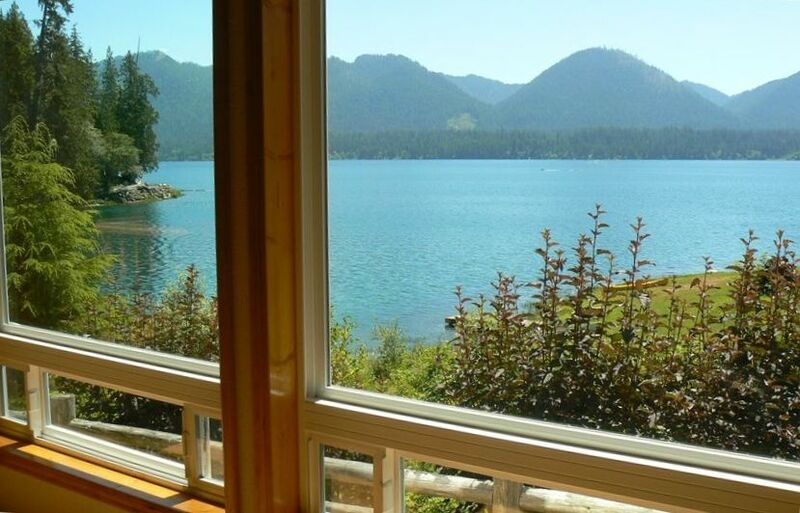 Enjoy the views from this custom 2-story home from your wall of windows overlooking glorious Lake Quinault. The adjacent wetlands and creek on the property are popular nesting grounds for an array of birds and wildlife. Bald Eagles, Osprey and Herons make frequent appearances. The home features an expansive lawn leading down to the private beach and outdoor fire pit. The beach offers a gradual descent; perfect for children to wade, play and swim. Let your dogs run wild here! Inside you will find everything you need for comfort and relaxation. The home boasts a sun room with amazing views, air hockey table, gas BBQ and Charcoal BBQ and Hot Tub on covered deck, Outdoor fire pit, Jacuzzi tub in master bath, double sided gas fireplace that adjoins a smaller living room to a spacious recreation / living room. Complimentary Wi-fi. Snuggle up in the sun-room or on the deck and take in the tranquility that surrounds you. After a long day exploring the bountiful outdoor opportunities, relax in the rain sheltered outdoor hot tub and let the stress of the outside world melt away, or enjoy a private jetted Jacuzzi soaking bath in the master bedroom suite upstairs. BR#1 - Upstairs, Master Queen bed + 2 Toddler beds + pack-n-play + walk-in closet + Jacuzzi tub/shower bathroom. Comfy couches/recliners and extra-soft padded carpet with dark shades in the Rec Room. Queen Bed + Child Size Futon + Crib + 2 love seat lazy-boy sofas with recliners, full kitchen/bar stools/counter, full bathroom, TV/satellite/DVD/VCR. 1 Queen Bed, 1 Queen Futon, Shower/Toilet bathroom, TV, microwave, small fridge. In order to rent either studio, guests must also rent the Main House. These spaces are intended to serve as optional sleeping spaces for Main House guests and cannot be rented independently. This is truly a magical retreat where seclusion, privacy and beautiful mother nature converge to create the perfect getaway. My name is Cleo. I am the mother of 2 and currently live in Olympia, WA. I grew up in Lake Quinault and as an 18 year old, could not wait to leave. I attended college on the East coast near Boston, MA and found myself truly missing this beautiful place. I missed the trees, I missed the Pacific ocean beaches, I missed the stars, I missed the sound of the frogs at night and I even missed the ridiculous amounts of rain. I returned to Lake Quinault after college and shortly afterwards, married my best friend who shares my love for the area. We lived in the community for a few years operating his family's business. We moved to Olympia in 2002 to pursue our careers and are now only a 2 hour drive away from our vacation home. My husband bought this property well before we built this home together. He recognized the unique beauty of this property sitting at the end of a dead end private drive with so many feet of private lake frontage. We built the home with the intent to live in the valley and operate his family's business. Our paths changed after a few years and we both opted to pursue different careers requiring a move to Olympia. My husband's parents moved into the home and slowly added on. They built the garage and apartment above, they added the spacious recreation room and the sunroom and the garage studio/exercise/game room. After we had our first baby, they retired and moved to Olympia to be near us. We feel grateful to be able to keep this beautiful home in our family while also providing the opportunity to share it with guests who also understand and appreciate the beauty of this unique area!. We visit this beautiful area as much as we can with our family; our two children and our dog love it! Main House: (1) Bathroom Downstairs with full bath, (1) Bathroom Upstairs in Master BR with jacuzzi tub + shower. Upstairs Apartment: (1) bathroom with full bath. Downstairs Studio: (1) bathroom with shower. Perfect home, comfortable and we'll appointed. Breathtaking setting, beautiful in rain and sun. Cleo was incredibly responsive. This home is as advertised, except that pictures don't do it justice! It's a remarkable piece of land nestled into the rain forest with lots of outdoors activities nearby. The house was nicely stocked and the owner was very accommodating. The owner was very kind and helped us recover some items that we had misplaced. I really appreciated the time and care that was taken to ensure we had a good stay. I highly recommend this place! 5 stars for our 2018 Christmas Family Adventure! Beautiful home and very comfortable! All the modern conveniences (fully stocked kitchen, laundry, bedrooms, linens and blankets, bathrooms, jetted tub, toddler beds, toys for the kids, games, air hockey table, hot tub, convenient location). Our family thoroughly enjoyed our 4 day stay. We will definitely be back and HIGHLY recommend this property!! This is a huge house with a stunning view over Lake Quinault. The home was clean, comfortable and had a well-equipped kitchen. It's secluded and quiet. There are a couple small grocery stores nearby and some nice restaurants (Lake Quinault Lodge Roosevelt Dining Room; Salmon House) on the other shore of the lake. There are beautiful hikes nearby in the rain forest. We loved it here! Amazingly beautiful setting for our family get together!! From our 88 year old active grandma to our 2 1/2 year old active grandson and every age in between, the property had plenty to offer to all! Even though the weather was a bit too cold for swimming, some still managed to get on the paddle boards and inflatable boat. One of the highlights in the early evening was watching otters playing in the cove! Outdoor fire pit was amazing for our s’mores making. It was a very memorable trip! Additional costs to rent additional separate garage studio units: Above Garage Studio ($150/nt + $25 cleaning fee + 11.5% tax) Ground floor Garage Studio ($100/ + $25 cleaning fee + 11.5% tax) Pet fees: $25/per well behaved potty trained dog Additional person fees: $15/per person/nt for additional people beyond 8 adults/main house, 10 adults/main house + upper studio, 12 adults/main house + upper and lower studios.